Combine math, science, and a little competition with this fun experiment! First find a super stretchy rubber band. Mine measured three inches at rest. Grab some sidewalk chalk and a ruler and head outside. Stretch rubber band and aim, but don't shoot yet! Have a friend measure the stretched band with a ruler. Then, let go and mark where your rubber band lands. Next to the mark write down how far the band was stretched before shooting (see image). Math - You already did some math, by measuring your rubber band before each shot. Now, use a tape measurer to record the distance from the shot to where the band landed. Example - 14 inch stretch before shot and band landed 14.5 inches from where I sat and shot it. Science - Talk about potential and kinetic energy. A rubber band has potential energy and when in motion, it's energy is kinetic! 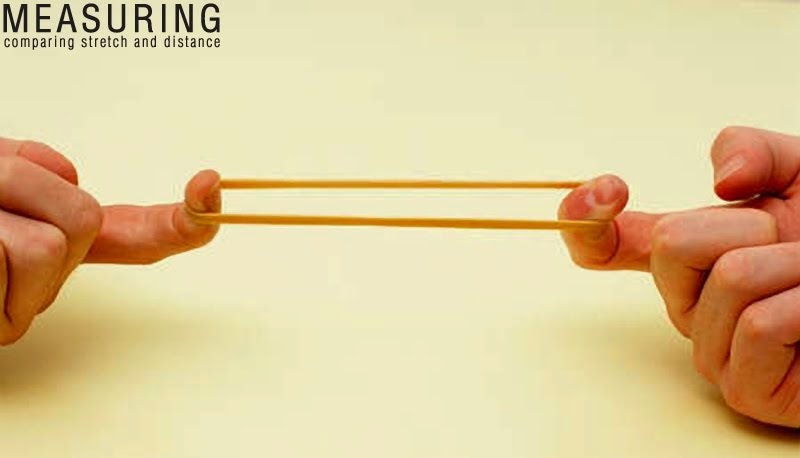 By stretching the rubber band way way way far out, it will shoot farther. Visit Science Buddies for a recording sheet and more twists on this experiment!